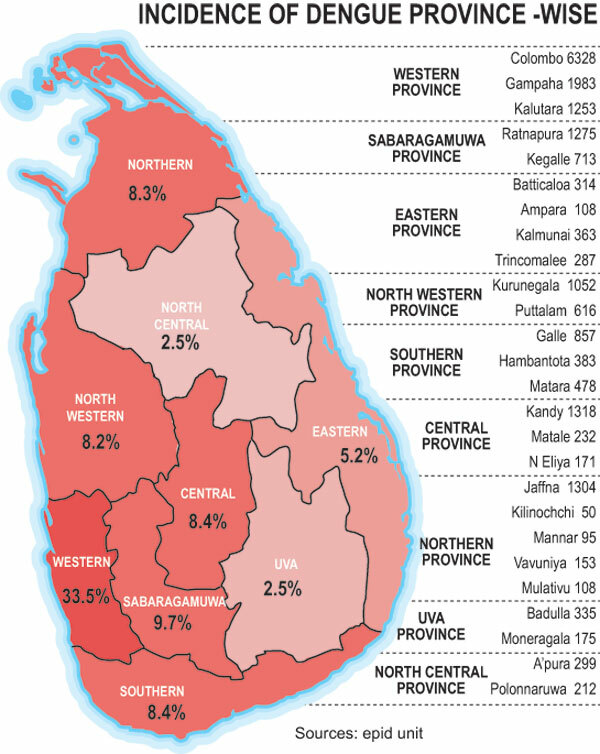 Seven districts in the country are at high risk of dengue epidemics – Colombo, Gampaha, Kandy, Kalutara, Jaffna, Ratnapura, Kurunegala – with more than 20,400 people ill of the virus in these areas. The incidence of dengue fever has increased by 20 per cent in June this year compared with the figure last year. Hospital chiefs around the country are concerned that public negligence is pushing up the casualties. “The admission of dengue patients has increased,” the Acting Director of Gampaha General Hospital, Dr. Dinesh Koggalege said. He believes the spread of infection as well as the deadly nature of the virus is pushing up hospital admissions. The hospital’s Dengue Unit is placing patients in separate rooms, and even air-conditioned rooms have mosquito nets around beds to minimise the spread of the disease, while continuous fogging is carried out to kill mosquitoes. “The lack of public participation in clearing infestation-prone belongings and local environments have caused concern among the officials. Many of them believe that this virus, which has no cure, could only be countered through public co-operation,” Dr. Koggalege said. Ratnapura Provincial Hospital Director Dr. Sampath Ranaweera said garbage disposal is the major problem in the urban areas of the Western Province. Health officials aimed to have every household use its own backyard to dispose of garbage appropriately. Kurunegala’s Chief Medical Officer of Health, Dr. G. Gallage, said when a dengue case was reported in a particular area public health inspectors and police offered assistance to those householders to clean the premises. “We collect the names of patients admitted into hospital as dengue positive cases and clean their premises,” he said. Kalutara Hospital too has seen a high number of patients this week, Acting Director Dr. Vajira Dissanayake said, adding that not only dengue patient wards but other medical wards and children’s wards have been equipped with nets to secure patients from mosquitoes. A spokesman for Batticaloa Hospital said Batticaloa had a low number of dengue cases but measures were being taken to reduce the illness further. Kandy Municipal Council Chief Medical Officer Dr. Asoka Senarath said he would count on the police environment unit and the military for help in dengue control. “Under the Public Nuisance Ordinance the Central Province has now been given powers to take legal action even against government authorities. This was brought as there have been increasing complaints ofmosquitoes breeding in blocked canals, side drains and over poor waste management,” Dr. Senerath said. Police Environment Protection Division Director, SP Quintus Raymond said his officers had been given orders to make arrests of people whose negligence created dengue breeding grounds. “We have taken to making arrests because if we did not do so, people would not take much notice. This makes them take extra precautions. When a death occurs then they turn and point fingers at the health authority,” he said. A scientific survey carried out by National Dengue Control Unit (NDCU) reveals that schools had the highest proportion (63.9 per cent) of containers found to be breeding sites while 21 per cent of work or public spots and 11.9 per cent of residential premises tested positive. Common breeding grounds for the dengue mosquito include discarded containers (48 per cent), water tanks (22 per cent), discarded tyres (0.7 per cent), and gutters (0.2 per cent). In rural areas, severe outbreaks come from areas with limited access to tapwater where water storage vessels provide breeding sites for the mosquitoes, Ministry of Health Chief Epidemiologist Dr. Paba Palihawadana said. “Currently the threat pertains in the Western Province and other districts such as Kandy, Kurunegala, Jaffna, Kalutara, Galle and Ratnapura,” Dr. Palihawadana said. “Our main objective is to reduce the number of deaths,” she said. According to the Epidemiological Unit last month alone 2,768 dengue cases were reported islandwide. The highest number of cases for this year has been recorded in the Colombo district with 6, 528 cases and Gampaha with 1,983 cases. Kandy and Jaffna followed with 1,357 and 1,304 cases respectively. Ratnapura, Kalutara and Kurunegala also had more than 1,000 cases each this year.